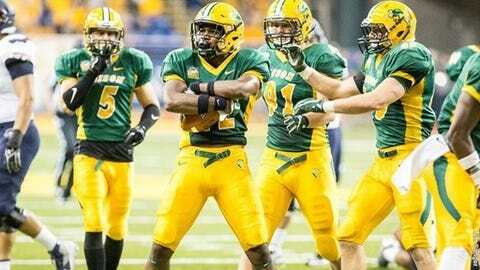 (STATS) – They’re not the defending FCS champions for a change, but the North Dakota State Bison are playing like they’re the team to beat again. Behind junior quarterback Easton Stick’s four total touchdowns, the No. 2 playoff seed hammered seventh-seeded Wofford 42-10 in an FCS quarterfinal Saturday before 17,008 at the Fargodome. NDSU (12-1), which had a first-round bye and then routed San Diego 38-3 in the second round, will host a national semifinal next Friday night against the winner of Saturday’s quarterfinal between Kennesaw State and No. 6 seed Sam Houston State. The Missouri Valley Conference champ is making a record seventh straight appearance in the semifinals, with the 2011-15 seasons leading to five straight national titles before the Bison lost to eventual champion James Madison in last year’s semis. NDSU kept drives going and Wofford (10-3) didn’t, the difference showing in the Bison converting 10 of 13 third-down attempts and the Terriers just 1 of 12 (although they were 3 of 4 on fourth downs). After trailing 3-0, the Bison scored touchdowns on five of their final six possessions of the first half to put the Terriers away by halftime 35-10. Stick, who is 32-3 as a starter, was 9 of 10 for 157 yards in the half, throwing touchdowns to tight ends Connor Wentz (48 yards) and Jeff Illies (4) and running back Seth Wilson (18). Bruce Anderson scored on 5- and 1-yard runs. Stick also scrambled for a 7-yard touchdown in the third quarter. He finished with 233 yards of total offense in three quarters of action. Wofford, the Southern Conference champ, lost its comfort zone as a triple-option team, and forced to pass the Terriers went just 3 of 12. They were without injured halfback Lennox McAfee, its No. 2 rusher, and had 37 carries for 134 yards – 120 below the Terriers’ season average. Blake Morgan’s 54 yards led the way. NDSU safety Robbie Grimsley and linebacker Jabril Cox had fumble recoveries and linebacker Chris Board collected a team-high nine tackles in the strong defensive effort. The Bison head into the semifinals with a 20-1 home record in the FCS playoffs – all this decade.